The entire program in which this segment was originally heard is here. Nationalized healthcare has been in the news recently. I am going to talk about aspects of the National-Socialist approach to this. Socialized medicine in Germany had its beginnings under Bismarck in 1883. An important impetus to socialized medicine, and to socialism in general, was German militarism. It was observed by Gustave Le Bon in his Psychology of Socialism that the military is in effect a socialist institution, and that men who serve in the military become habituated to socialism. Bismarck had another motive for creating Germany's welfare-state, which was to take the wind out of the sails of the Marxists. Bismarck's system of compulsory health-insurance became the model for socialized medicine in other countries. Much of Adolf Hitler's agenda consisted of doing the same as Bismarck but more of it. That was the case also with socialized healthcare. It should not be surprising that a racial state would have socialized medicine, since such a state is strongly concerned with the hereditary constitution and quality of its people. Such a state has an interest in what kind of person you marry and how many children you have. Preferably you should produce children without any outlandish racial mixture and without hereditary defects, because the future of the whole society is affected by this. There are some possible objections to socialized medicine, however, apart from the general objection to socialized everything. These objections are really objections to healthcare per se. One objection, that Americans are mostly afraid to state, is that non-Whites might benefit more than Whites from free healthcare. This consideration is a source of White opposition to all sorts of public amenities. In Germany that was not a problem. Another objection, especially in the United States, is a general distrust of government, and a tendency to assume that anyone who has any dealings with the government is using it to pad his own pockets at public expense. This problem also does not exist in Germany. German civil servants are known for being efficient and conscientious. The main criticism of healthcare in Germany was that it aided the survival of the unfit, since the unfit will have the greatest need of healthcare, while congenitally healthy people will have relatively little need of it. In the introduction to the 1895 book in which he coined the term racial hygiene, Alfred Ploetz, a Social-Democrat who 42 years later joined the NSDAP, stated some objections to healthcare. This is an excerpt. At first glance one could suppose that the conditions for the prosperity of a race were the same as the conditions for the prosperity of every single member of it, that the care for the health of the race and the customary healthcare of the individual were one and the same. This is not the case however without something further, and there are excellent researchers who even want to acknowledge a deep conflict between modern healthcare and racial well-being. In any case it is apparent from the remarks of these men, including even the mild-mannered Darwin, that the view that the wellbeing of our race would be best attained through the improvement of living conditions for all individuals, is certainly not universally accepted. Therefrom follows the necessity to balance the concept of healthcare in the usual sense, individual hygiene, with another concept, that of the hygiene of a human collectivity. Thus one could speak of the hygiene of a nation, of a race in the narrower sense, or of the entire human race. The idea of racial refinement lay also at least partly at the base of the custom of the ancient Germans, to allow the father to kill feeble, ugly, or otherwise displeasing newborns. Christianity and modern democracy with their doctrine and demands of equality have so diminished the sense of race in the masses that the conflict between humanitarian socialist demands and racial wellbeing indeed no longer penetrates their consciousness. In the masses, I say. In the small circle of leaders and researchers, through the advent of Darwin and the political advance of Social Democracy, the racial interest has become very vital again, and the sword-blows of great and small knights of the mind rattle merrily through the springtime air of modern science. As a socialist informed by Darwinism, Ploetz advocates that the state assist the individual, but at the same time that the state should balance this with racial hygiene. The escalation of our brain-talents is the most necessary condition that we know for an improvement of our conditions of happiness. Eugenic laws started in the United States. In 1896, Connecticut enacted a law forbidding the marriage of any person who is "epileptic, imbecile or feeble-minded." Since a ban on marriage did not prevent the “imbecile or feeble-minded” from reproducing, the logical next step had to be forced sterilization of people whose reproduction was undesirable. In 1907 the American state of Indiana became the first state to have a eugenic sterilization law. Although 30 states adopted eugenic sterilization laws, the actual implementation of eugenic sterilization in the United States was limited because of lawsuits. In Germany, with Hitler as the autocratic ruler, eugenic sterilization could be implemented on a grand scale. There were however safeguards to make sure that it was not done without justification. Lothrop Stoddard visited Germany in 1940 and reported on what he saw. 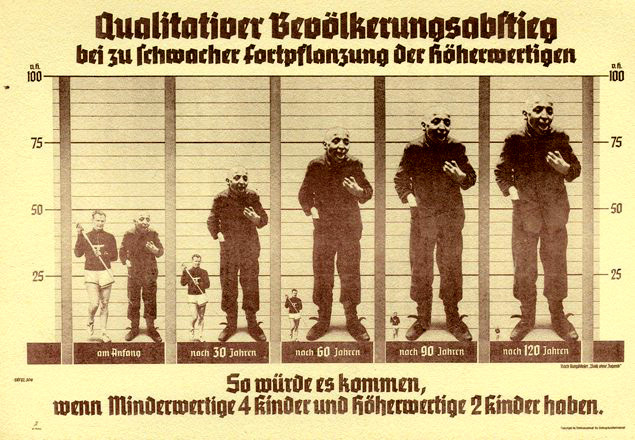 As the Nazis saw it, they had a two-fold task: to increase both the size and the quality of the population. Indiscriminate incentives to big families would result largely in more criminals and morons. So they coupled their encouragements to sound citizens with a drastic curb on the defective elements. That curb was the Sterilization Law. The object of the statute is set forth in its official title: An Act for the Prevention of Hereditarily Diseased Offspring. The grounds for sterilization are specifically enumerated. They are: (1) Congenital Mental Deficiency; (2) Schizophrenia, or split personality; (3)Manic-Depressive Insanity; (4) Inherited Epilepsy; (5) Inherited (Huntington's) Chorea; (6) Inherited Blindness; (7) Inherited Deafness; (8) Any grave physical defect that has been inherited; (9) Chronic alcoholism, when this has been scientifically determined to be symptomatic of psychological abnormality. It should be understood that all these defects and diseases have been proven to be hereditary by scientists throughout the world. It was estimated that at least 400,000 persons in Germany were known to be subjects for sterilization. But the law specifically forbids sterilization for any non-hereditary cause. Even mentally diseased persons, habitual criminals, and ordinary alcoholics cannot be sterilized [if it is not shown to be hereditary]. Each case up for sterilization must be proved beyond a reasonable doubt before special district courts, and appeals from their verdict can be taken, first to a regional court of appeals, and ultimately to the High Appellate Court sitting in Berlin. Such are the provisions of the Sterilization Law. So many charges have been made outside Germany that it is being used to sterilize politically undesirable persons that I particularly welcomed the opportunity to study at first-hand the High Court's proceedings. Germany's Eugenic Supreme Court sits in an impressive building at Charlottenburg, one of Berlin's western suburbs. I arrived just as court was opening. On the bench sat a regular judge in cap and gown. At his right was the celebrated psychopathologist, Professor Zutt, a typical savant with mild blue eyes and a Vandyke beard. At the judge's left was a keen-eyed younger man who was a specialist in criminal psychology and beside whom I sat during the proceedings. All three courteously explained points to me at frequent intervals. Since this was the court of last resort, all matters came up to it on appeal from lower courts, and thus tended to be "hairline" cases. The thing that struck me most was the meticulous care with which these cases had already been considered by the lower tribunals. The dossier of each case was voluminous, containing a complete life-history of the subject, reports of specialists and clinics, and also exhaustive researches into the subject's family history. In reaching its decision, the High Court not only consulted the records of the case but also personally examined the living subjects themselves. The first case I saw looked like an excellent candidate for sterilization. A man in his mid-thirties, he was rather ape-like in appearance -- receding forehead, flat nose with flaring nostrils, thick lips, and heavy prognathous jaw. Not vicious-looking, but gross and rather dull. His life-history was mildly anti-social -- several convictions for minor thefts and one for a homosexual affair with another boy when a lad. In early manhood he had married a Jewess by whom he had three children, none of whom had showed up too well. [...] He was now seeking to marry a woman who had already been sterilized as a moron. The law forbids a non-sterilized individual to marry a sterilized person; so he was more than willing to be also sterilized. The lower court recommended sterilization. All three members of the High Court interrogated the man at length. Questions disclosed the fact that he conducted a newspaper delivery route in the suburbs, that he was able to run this simple business satisfactorily, and that he answered the Court's queries with a fair degree of intelligence. The Court concluded that sterilization had not been proven mandatory and sent back the case for further investigation. Case Two was obviously unbalanced mentally, though not an asylum case. Swinging a cane like a fine gentleman, he entered Court with an "air," which went incongruously with his shabby-genteel clothes and the battered felt hat tucked under his left arm. There was no doubt that he should be sterilized. The lower courts had decided he was either a schizophrenic or a manic-depressive, and both defects came under the law. But which of the two it was had to be clearly determined before the operation could be legally performed.... The Court inclined to think him a manic-depressive, but they also detected schizophrenic symptoms. Since they were not absolutely sure, the case was remanded for further clinical investigation. Case Three was an eighteen-year-old girl. A deaf-mute, she talked through an interpreter. She was obviously not feeble-minded, but had a poor family record. The parents, who also appeared, were most unprepossessing. Her case had first come before the lower court two years ago. It then decided against sterilization because no hereditary deafness was shown in the family record. Recently it had recommended sterilization because several unfortunate hereditary factors in the family had been disclosed by further investigation. The High Court ordered the girl sent to a clinic for observation. It also ordered more research into the family record. Case Four was a seventeen-year-old girl. The issue was feeble-mindedness. She certainly looked feebleminded as she sat below the bench, hunched in a chair, with dull features and lackluster eyes. Left an orphan at an early age, she had had a haphazard upbringing. The record showed her to have been always shy, backward, and unable to keep up with normal schooling. The members of the High Court examined this poor waif carefully and with kindly patience. She had no knowledge of or interest in even the most elementary current events. For instance, she barely knew there was a war going on. But the psychologist discovered that she was able to make change for small customers' bills in her restaurant and that she could perform other duties of her humble job. So the Court finally concluded that, despite her most unprepossessing appearance and her simple, childlike mind, she was not a moron within the meaning of the law and therefore should not be sterilized. There were other cases that day, all conducted in the same painstaking, methodical fashion. I came away convinced that the law was being administered with strict regard for its provisions and that, if anything, judgments were almost too conservative. On the evidence of that one visit, at least, the Sterilization Law is weeding out the worst strains in the Germanic stock in a scientific and truly humanitarian way. That is excerpted from Lothrop Stoddard's book Into the Darkness (1940). Stoddard then discusses the measures whereby the National-Socialists have succeeded in dramatically increasing Germany's birthrate. So, What Would Hitler Do? In a state like pre-1945 Germany, without large unassimilated and unassimilable racial minorities, of course Hitler would go all out with socialized medicine, but also introduce eugenic sterilization to ensure that the hereditary quality of the nation does not deteriorate as a consequence. Our case in the United States however is different. We have those large unassimilated and unassimilable minorities, and a very weak sense of community because of it. In a state that has a large unassimilated racial minority, Hitler I believe would try to solve that problem before expanding services to the people. After that, it might be possible to increase public-spiritedness and reduce mutual distrust so that the presumption of waste and corruption in government will disappear. Then, finally, the groundwork might be laid for socialized medicine to function well in the United States. Everyone worked in Germany. It was not like welfare in Jewed Countries. Good job Hadding. I've admired your clear unapologetic understanding of national socialism.